Today was a nice day for tennis in Florida…a bit cloudy but warm (80s) and not too windy. We won the final over Mary Ginnard/Kathy Vick 64 62. Pam played GREAT and we played well together. We were down 43 and after that made very few errors. It was a fun match with good rallies. Inge Weber won the 75 singles over Lyn Tietz 63 63 to retain her title here. 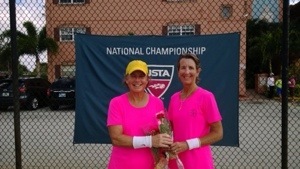 Susan Boyer won the 45s in three sets over Vesna McKenna 57 62 63. Mary Ginnard and Vesna McKenna were playing the doubles final against Tracy Viebrock/Heather Herman…it was Tracy’s third match of the day…when we left and Ginnard/McKenna were up a set and up in the second set. 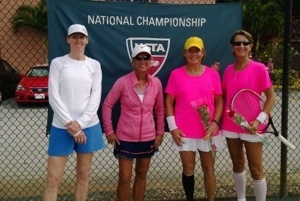 Betty Wachob won the 65s over Carol Clay in two hard-fought sets and Brenda Carter finished third.